JAKARTA, Indonesia, Sept. 18, 2018 /PRNewswire/ — Today, Honor, the leading smartphone e-brand, officially introduced the new Honor 9i in front of over 300 media, KOLs, and fans in Jakarta, Indonesia. With the concept of “Beauty All Around”, this budget smartphone is equipped with a magnificent and upgraded mirrored glass design that will disturb the whole smartphone industry. The launching of Honor 9i that follows the overwhelming global market success of Honor 9 Lite and Honor 10 is a part of Honor’s strategy to become one of the top three smartphone brands in Indonesia in the next three years. Looking beautiful both inside and out, Honor 9i is a style icon and the perfect device for capturing and sharing your life’s best moments with a 12-layer glass design with mirror-like effect, an outstanding 16MP front camera and the 13MP + 2MP dual rear camera. To enrich the user experience, Honor also embeds the latest technologies in order to deliver a flagship-like performance. Furthermore, aside from KLY Media Group and Happa, Honor also values other business partners including VivaVideo, KwaiGo, Tantan, Bigolive, Liveme, and Nonolive. Honor believes the power of co-creation and desires to grow with all the business partners as well as achieve a great success together. With its innovative devices and precise targeting strategy, Honor continues to lead the industry in its home market as the No. 1 smartphone e-brand in China, while expanding rapidly overseas, including Indonesia. The brand has achieved 150% increase year-on-year in international sales volume outside of China in the first half of 2018. In Indonesia, Honor just released its half year sales result with remarkable achievement by 100% monthly growth in the first half of 2018. In May this year, Honor surpassed Apple to become Russia’s No. 2 smartphone brand in terms of sales volume, after having placed a strong third for the prior 13 months. The brand is also the fastest growing smartphone vendor in India, with a 300% increase in sales volume and revenue in the first half of 2018. Honor 9i is encased in a slim body sized to fit your hand and comes in a delightful range of stunningly colorful reflective glass designs. The device is crafted with 12 layers of 2.5D glass on both the front and back for a mirror-like effect. The more compact design has a bigger, customizable Notch display. Its 5.84″ screen is set within a rounded body that would traditionally feature a 5.2″ screen. Consumers will be pleased to discover they can now switch freely between the bigger 19:9 Notch View and 18:9 FullView displays and still maintain a large field of vision while gaming or watching their favorite TV shows and movies. The 16MP ISO-enhanced front camera sets a new standard for taking selfies in low-lit environments. The 4-in-1 light fusion function intelligently enhances the sensitization, reducing image noise and producing clearer and, therefore, more attractive self-portraits. The 13MP + 2MP dual-lens rear camera is enabled with Wide Aperture function and is supported by a suite of camera modes to record the wonderful moments in your daily life. The Kirin 659 Octa-Core processor and EMUI 8.0 system guarantees a smooth, consistent performance, supported by a strong 3GB/32GB storage and 4GB/64GB storage, meaning the possibilities are endless for users, whether they’re running multiple apps at once or playing high-performance games. The Honor 9i also supports both face and fingerprint unlock, meaning you can open your phone without typing a password or needing to scan your fingerprint. Face Unlock is fast and convenient compared to other unlock methods and this new generation of multi-function fingerprint 4.0, unlocks your phone in 0.25 seconds. The Honor 9i will be available in two classic and beautiful colors, Midnight Black and Sapphire Blue, along with a special color Robin Egg Blue that will be launched in Indonesia in October 2018. 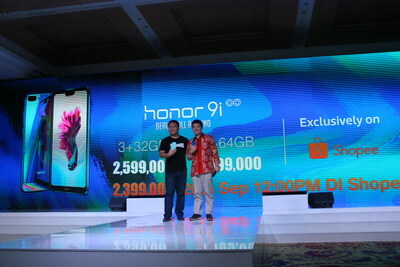 During the launching event, James Yang, President of Honor Indonesia together with Chris Feng, the Global CEO of Shopee Group announced the official price, first sales date, and sales channel of Honor 9i. This smartphone will be available in the market starting from 12.00 PM on 20 September 2018, exclusively on Shopee with the price of IDR 2,599,000 for the 3+32 GB version and IDR 3,099,000 for the 4+64 GB version. On 20 September 2018, Honor will also hold “Honor Super Brand Day” to provide the consumer with special offerings of Honor 9Lite, Honor 7S, Honor 7A, Honor 7X, Honor10, as well as Honor View 10. Based on Honor laboratory testing.